Did you know that 13% and 39% of all dental injuries occur while playing some kind of sports? Up to 75% of those dental injuries affect at least one of the most visible teeth in our smile. The most common sports-related dental injuries include: broken teeth, knocked-out teeth, injured cheeks or tongue and even broken jaws. At Point McKay Dental we recommend that anyone who participates in athletic activities should protect their smile with high quality, proper fitting sports mouthguard. A properly fitted sports mouthguard absorbs the shock of impacts. The mouthguard also protects teeth against potential chips, cracks, fractures, knock-out, and damage. A properly fitted sports mouthguard is an important equipment investment, especially when considering the cost of the potential dental work required to repair damaged teeth. For all of your NW Calgary Sports Mouthguard needs, we welcome you to book a consultation appointment today. You can also discuss your sports mouthguard options at your next hygiene and check-up appointment — just ask! We look forward to hearing from you! 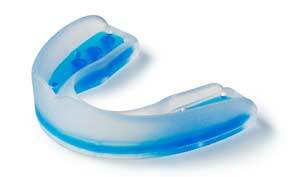 Call us at (403) 283-7829 to book your Sports Mouth Guards Consultation with us today!